The increase in the size of ships and the consequent decline of the fishing industry in Ipswich during the latter half of the 18th Century deprived many families of their means of support and compelled an increasing number of the inhabitants to ask relief from the Town. The town responded by ordering the Sheriff to serve summons on anyone who arrived in the town without the Town’s consent, giving them fifteen days to depart. The Legislature repealed the law which made this possible. *Information, text and dates in this article come from Ipswich in the Massachusetts Bay Colony by Thomas Franklin Waters. The town’s petition for relief was denied by the General Court. 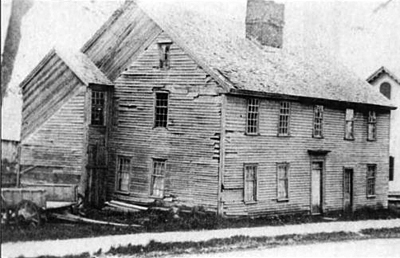 The William Caldwell house on High Street exemplified the reputation of Ipswich as “a town that time has passed by.” The house no longer stands. The inhabitants of the part of Ipswich known as Chebacco (now Essex) built a meetinghouse in 1674 and established their own parish in 1679, after encountering considerable resistance from the mother church in Ipswich. Chebacco residents were still residents of the town of Ipswich. The movement for complete separation gained strength on New Year’s day, 1818 when $10,500.00 was appropriated by the town of Ipswich to build a Town Farm for the Poor. On April 6, 1818, two hundred and six men of Chebacco petitioned the Legislature for incorporation as a separate town, and to not be held for any part of the new and expensive establishment for the relief of the poor. The Town of Ipswich protested against the separation, “unless an indemnity or equivalent is given by them for the large sums of money expended for the support of the large number of paupers.” Although Chebacco had its share of poor people, it also had a thriving shipyard in which to employ them. The word “Chebacco” was a Native American name for the lake that lies between Essex and Wenham. The citizens of Chebacco chose to name their town Essex, and it was incorporated on Feb. 5, 1819, with a $3000.00 payment to the mother town Ipswich to settle accounts, including the poor, and an additional $2270.00 for their share of public property remaining in the new town’s hands. 1832 map of Ipswich, showing names of surrounding towns.